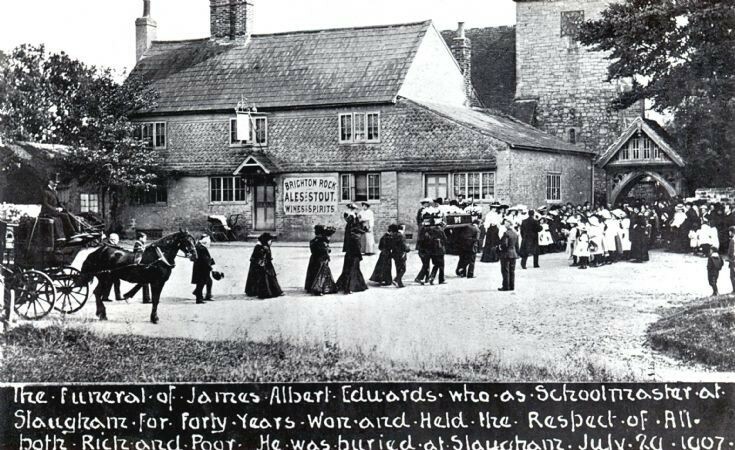 James Albert Edwards was headmaster of Slaugham school from 1870 to 1878, and Handcross school from 1878 to 1907. He was also the organist at Slaugham church for 20 years. At the funeral the schoolchildren, many carrying flowers, formed a guard of honour as their headmaster’s coffin was carried into church. Click on Large Version for a close up of the schoolchildren. I have been approached recently by Sophie McGlade from Devon who has requested information on her maternal great-great-great-grandparents, James and Hannah Edwards. The information, listed below, can be viewed by selecting Open Document. 2. Photograph of Hannah Edwards (née Railton). No doubt she is in the above photograph walking behind the coffin supported by one of her sons.